The mainstay of treatment for early-stage and locally advanced triple-negative breast cancer (TNBC) is chemotherapy. Anthracycline−/alkylator- and taxane-based regimens are considered the standard of care for the systemic treatment of high-risk triple-negative disease. Common approaches include sequential anthracycline/alkylator followed by taxane or concurrent delivery of an anthracycline, an alkylator, and a taxane. Shorter courses of treatment are considered appropriate for lower-risk triple-negative, node-negative tumors less than 1 cm. Despite treatment with anthracycline- and taxane-based chemotherapy regimens, about 30% of early-stage TNBC develop recurrent and metastatic disease, and many efforts are focused on how to optimize our current neoadjuvant and adjuvant approaches. Incorporation of platinum agents in the neoadjuvant setting appears promising, but long-term outcome data are needed. Treatment of high residual disease burden with additional chemotherapy after completion of neoadjuvant therapy is becoming an important area of investigation. The hope is that newer biologically driven strategies and development of biomarkers will lead to more effective and individualized therapy for TNBC. National Comprehensive Cancer Network. Breast cancer (Version 2.2017-April 6, 2017). 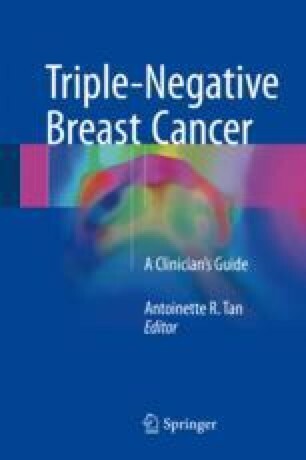 https://www.nccn.org/professionals/physician_gls/pdf/breast.pdf. Accessed 27 Aug 2017.